Shredded Beef Tacos are a classic Mexican food that can be easily made at home. 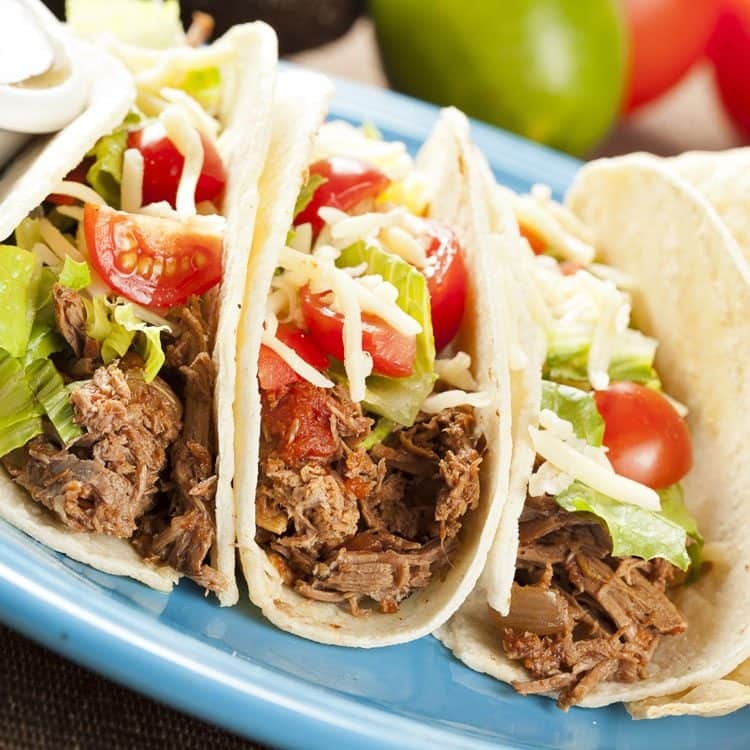 You’ll want to try this Copycat Cafe Rio Shredded Beef Tacos recipe. It is so full of flavor and worthy of savoring every single bite. We have a ton of slow cooker meals on All She Cooks. If you haven’t browsed through them, you really should. There is seriously something for everyone. Like our heavily Pot Roast, Million Dollar Chili, and slow cooker Zuppa Toscana. So, so, so good! 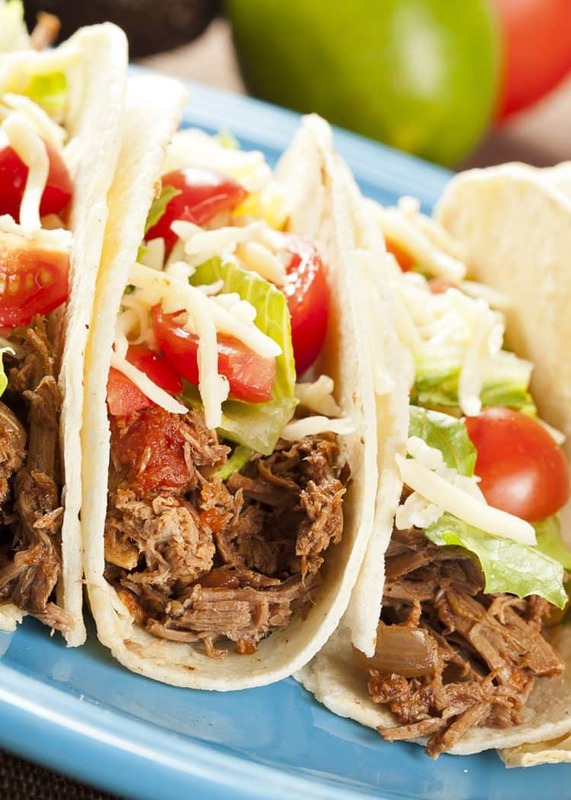 We love a good slow cooker meal, and Mexican Shredded Beef Tacos are no different. When cooking slow cooker meals, we have a few suggestions. 1st, you’ll want to use a slow cooker liner for the slow cooker. This allows for super easy cleanup. 2nd, a slow cooker travel bag is essential for carrying slow cooker meals to a pot luck. If you don’t have one, it is a worthwhile investment. 3rd, if you have a slow cooker laying around out of commission because of a broken crock, you can easily order replacement stoneware. Avocado is a healthy, delicious, creamy way to get your lycopene and beta-carotene. The healthy fats found in an avocado make absorbing all the healthy vitamins and minerals in other food much smoother for your body. Plus, they taste great. Shredded Beef Tacos give a great feeling of fullness. Don’t skip the avocado in this recipe, you’ll be glad you didn’t. 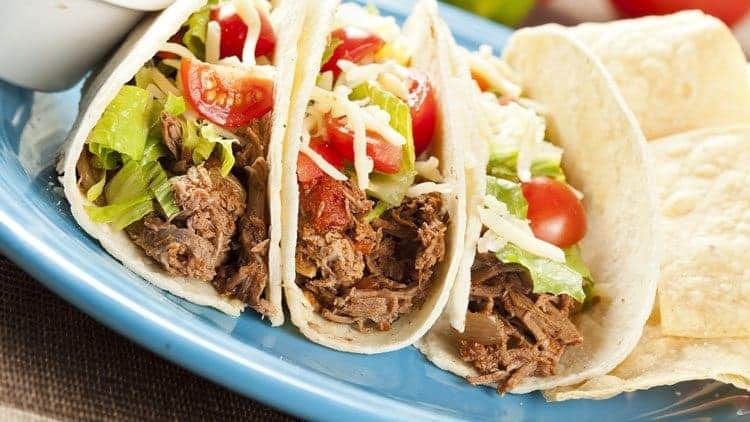 Beef shredded tacos make an fast and delicious dinner any night of the week. Serve with Spanish Rice or a side salad. Cut the onion into large, chunky slices. Place onion slices on the bottom of slow-cooker. In a bowl, combine broth, 1 tablespoon cumin, garlic and tomato sauce. Pour over the top of the roast. Covering the slow-cooker, cook on LOW for 6 to 8 hours. Strain the juices from the slow-cooker and save the juice. Transfer shredded meat back to the slow-cooker. Pour some of the strained juices over the shredded beef. Add the enchilada sauce and tomato paste. Add salt and extra cumin, to taste, for seasoning. Serve in taco shells with desired toppings. Blend all ingredients for the dressing in a blender or food processor, until smooth and creamy. Taste and adjust any flavors as needed. Refrigerate until ready to use.